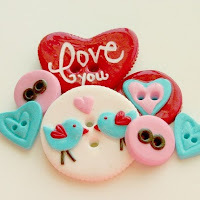 Tessa Ann's handmade buttons are just the cutest thing EVER! Her unique designs and vivid colors make them truly an element that will add that little something that makes your layout or crafting project extra special! Here are just a couple of the new sets that she currently has available that caught my eye this month. 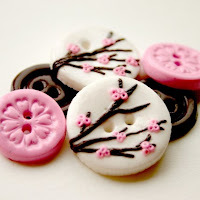 The first set of buttons on the left is called Love Birds and the second is Cherry Blossoms. Don't they just have you dreaming of Valentine's Day and spring!? You MUST check out her etsy shop today! Here's one new one that caught my eye on my last visit. It's called Love Scroll and will be perfect for any Valentine's Day themed layout! Visit Nicole's shop and find something perfect for your next layout today!